Wait, did we just hit 2015?!?! Does anyone else feel like this is very futuristic and we should be more in a "Jetsons" type era?! Does the year 2015 make anyone else feel old? Either way, 2015 is a new year, a new beginning, a new start! I'm hoping to make the best of it. While I don't plan on making my way in a literal wilderness, through streams and wasteland, I can absolutely see how this world is becoming wild and wasting away. I feel the need to focus on all things new in the Lord. For it is He who will one day make all things new again in Christ. Revelations 21:5 "Then He who sat on the throne said, 'Behold, I make all things new.'" The new year will bring about different things for different people. New jobs, new homes, new relationships, new challenges and new goals. For me, 2015 is going to bring me out of my comfort zone! Maybe somewhere I don't think I'm ready for yet! But in all things I trust where the Lord leads me, and if He says "go and do", than go and do I must! ;-) I have been very blessed with my life turning out "the way I always wanted." I would be married, and a stay at home mom, have well behaved kids (ha!) and a dog, with a home of our own. I would take care of my husband, children and home and my husband would take care of us. I would volunteer at the kids schools, drive carpools, have dinner on the table every evening and be active with our church family. Once the kids were old enough I would maybe dabble in a part time job to make sure my mind didn't turn to mush! Still, these were all things that have worked out according to "my plan". Then something came along to mess that all up... Passion! I have a passion for design. Design for home, for event planning, for my wardrobe ;-) and for LIFE! I am not trained in design, I am not a professional by any means, I barely have experience! I believe what I do have far outweighs that, because I have passion, oh and Jesus on my side! I simply LOVE this quote. 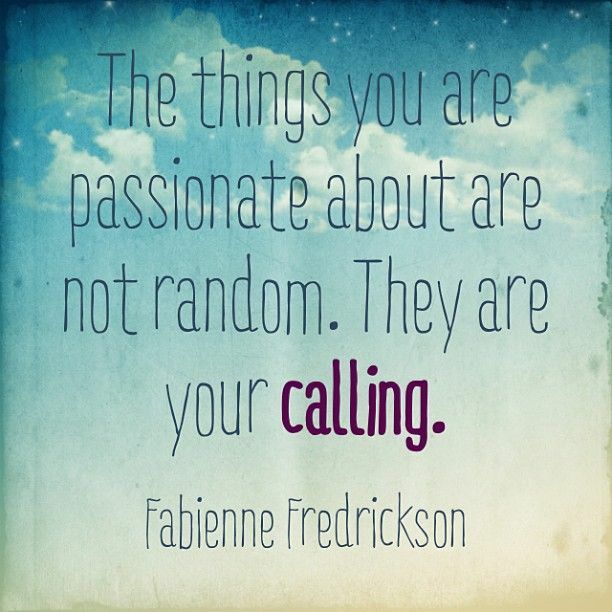 The things you are passionate about are NOT random! They are your calling! Thank you Fabienne Fredrickson (and my new instagram friend Allison from A House and a Dog for reminding me of this quote) for putting into words exactly what was keeping me from pursuing my passion. Jesus gives us the desires of our hearts, Psalms 37:4 says just that..."Take delight in the Lord and He will give you the desires of your heart." He gives us our passions, He knows what is best for us! Just like Jeremiah 29:11 says..."For I know the plans I have for you, declares the Lord, plans to prosper you and not to harm you, plans to give you hope and a future." If the Lord has given me the desire of my heart, (which is design) and I have a passion for this (which would be my calling) AND the bible says He knows His plans for me (which are to bring me hope), who am I to walk away from that!!! So here I am at the beginning of 2015 with a lot of "NEW" in front of me. I don't really know what all of this looks like, or what exactly I will accomplish but I trust the Lord does and that's good enough for me! I do want to share some goals with you and I will hope and pray that I will see these accomplished as the year continues on. Some goals are large, some are small, some will change and adapt over time, but here is what I'm starting with. ~Grow my blog. I am new at this whole blogging world, like brand new, as this is my 4th post! I would love to see improvements from me and to gain readers, like you! ~Master (maybe that's a stretch) the computer and techy side of all of this! I love to create, I hate the computer! I hope to blend these two worlds! ~ Grow my social media followers - especially Instagram. The IG world has pleasantly surprised me in it's super supportive community and I look forward to making so many new connections and friends on Instagram this year! ~ Complete some home improvement projects, DIY. We are living in our 5th home (this number does not include the apartments) since marriage and it's hard to continually "start over" in this area. We've lived in the 'dream home', we've lived in the 'make it work' home and we are currently in the 'cookie cutter' home! My goal for this house is to forget that it looks like all the neighbors on the outside and create our perfect home on the inside, one room at a time! I would love to hear from you! What does 2015 have in store for you and what goals do you have? Please leave a comment or feel free to email me!